Tory HQ are tweeting like mad in the run up to the election. I don't subscribe, but the economists I do read often retweet with succinct rebuttals. The main theme of the tweets seems to be that Labour mismanaged the economy. I've never really understood why Labour were unable to counter this with the obvious truth that the Tories are in denial about: that in 2008 the world underwent a Global Financial Crisis that saw banks going bust and many institutions, like my local city council, losing their savings. Labour seem incapable of using their handling of the GFC as a contextualising event for their economic decisions. By most accounts Brown managed the crisis well. Of course had the UK had proper regulation and oversight of the financial sector this crisis might not have affected us so badly - since other countries were doing much the same I doubt we could have avoided it completely. 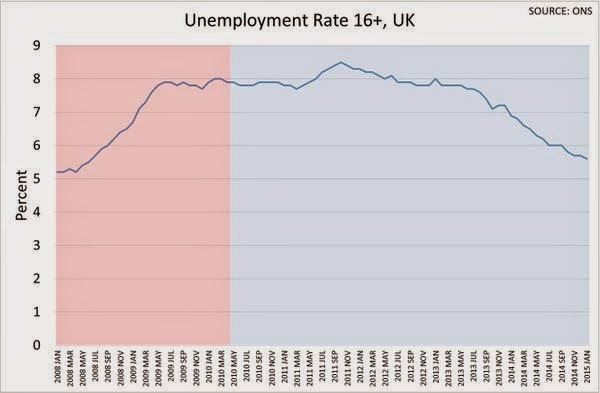 Today the Tories tweeted that we should remember that unemployment was rising when they took office. The simple answer to this is to show the ONS figures on unemployment. And this gives the lie to the Tory claim. Under Labour unemployment rose because of the GFC and then stabilised as recovery began. It rose after the coalition govt came into power and began to cut spending and stalled the recovery. It began to fall only after they eased up on austerity and much of the change is a result of zero-hours contracts and other measures that have seen the working poor reliant on food banks in many places (they were already dependent on Housing Benefit to pay rent in a grossly over-inflated housing market after successive governments have refused to build affordable housing). Another example of how austerity negatively impacted the economy and slowed recovery. There are plenty of examples of this happening. Why are Labour unable to capitalise on simple lies like this? Why do they continue to allow the Tories to keep them on the economic ropes? Why do they feel compelled to opt for Neoliberal-lite instead of a proper alternative? Why is it only the SNP that are actively against this ideologically drive austerity? At the moment we can only hope that the SNP do indeed end up holding the balance of power in the UK. They are the only party within reach of power that is offering a credible alternative.